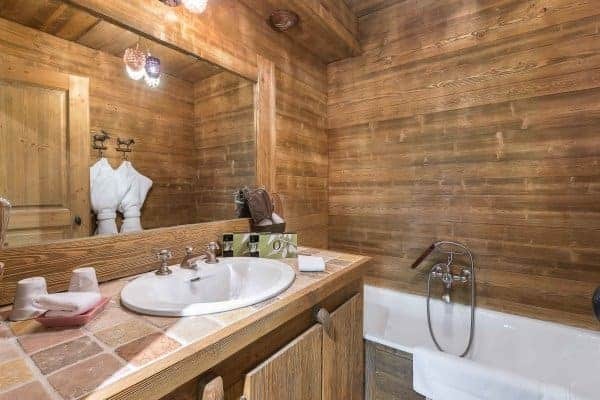 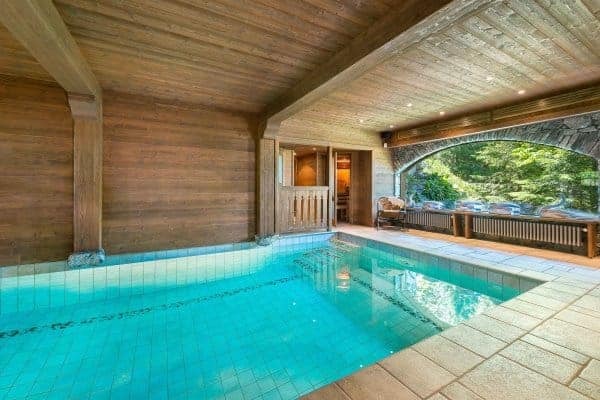 The exceptional Courchevel (1550) chalet located in protected area and hamlet of Les Brigues is, astonishingly, a mere twenty metres from the nearest ski slope. 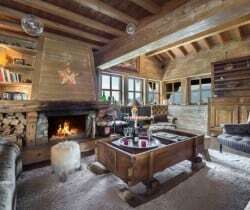 There is easy access to the ski lifts and to centre of the resort, which is one most exclusive in the European Alps and at the eastern end of the massive Trois Vallées/Three Valleys ski area offering a network of 50 ski lifts, access to slopes up to 1800 m, guaranteed snow cover to the end of April and also the largest and especially designed children’s ski area at Courchevel 1850. 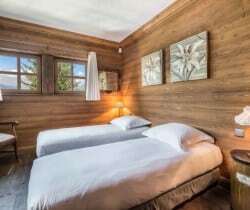 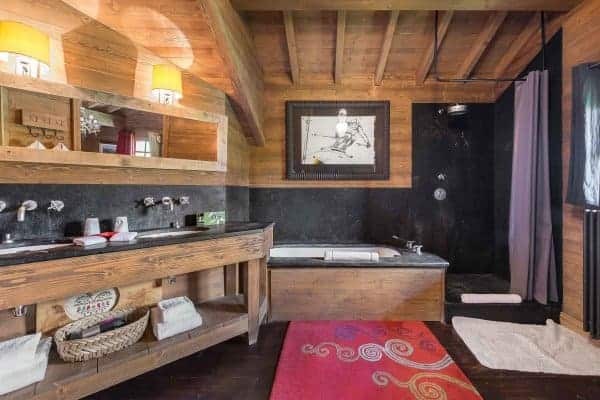 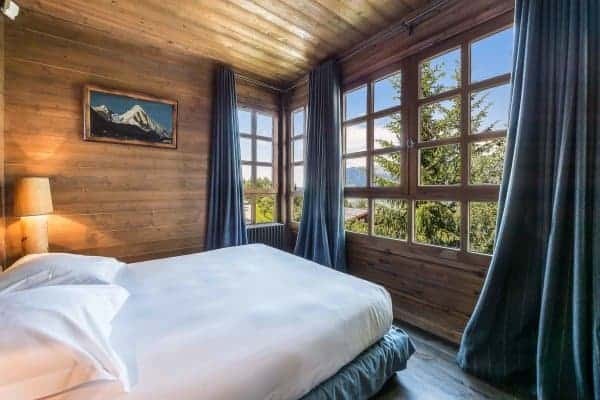 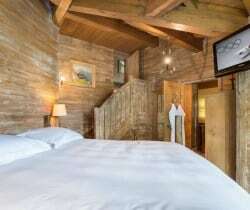 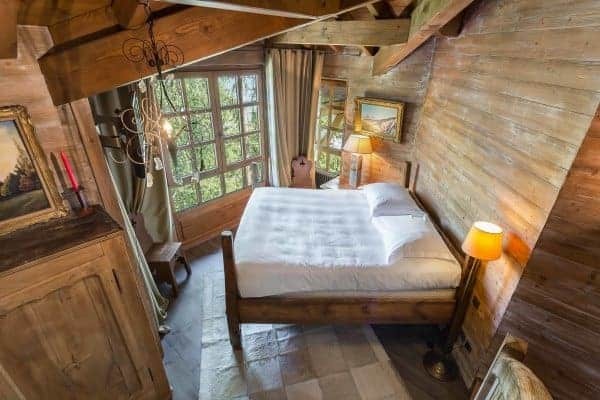 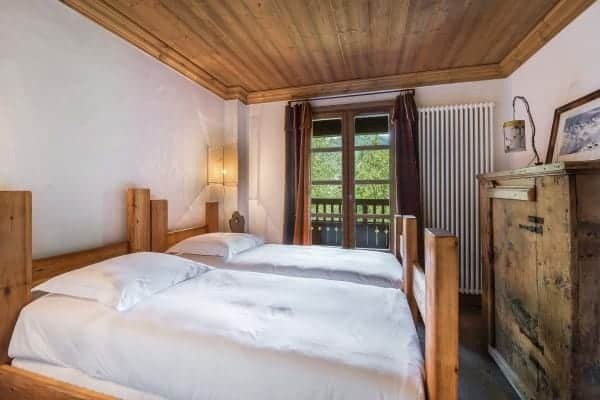 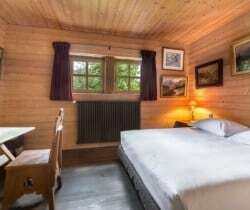 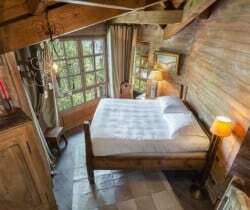 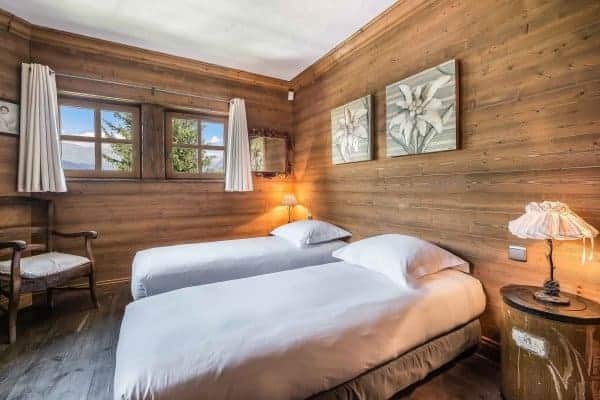 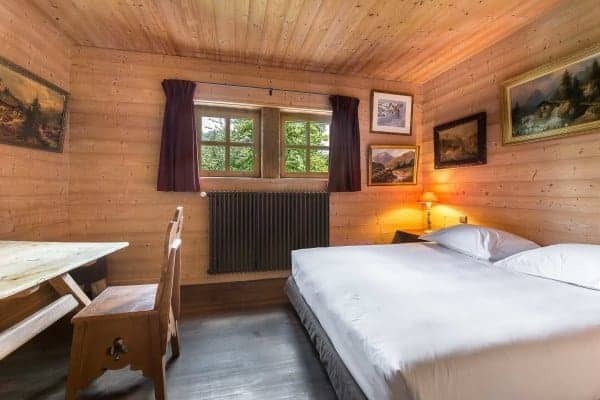 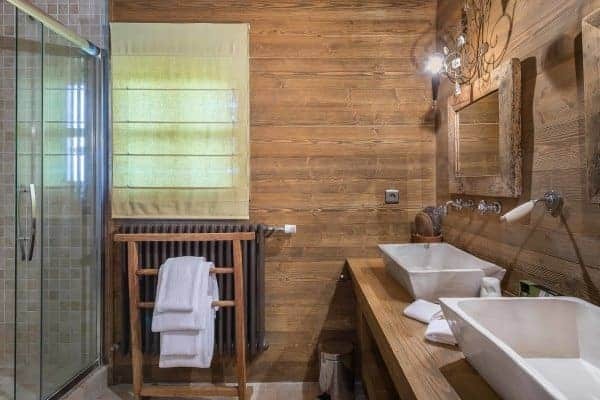 The closest international airports (Geneva 192 km & Lyon 185 km) are a 2-hour drive from this mountainside chalet with a traditional facade of grey stone and aged dark wood. 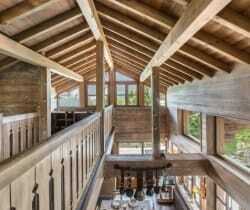 The interiors combine refurbished old with understated modernity. 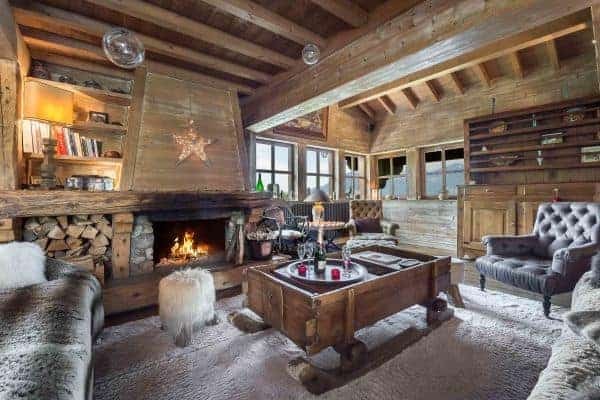 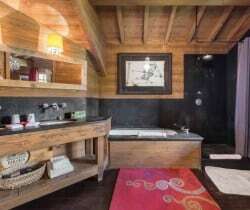 The flourish of wood-burning fireplaces, interconnecting open staircases (attention there essential for wee ones) and dapper pine and spruce interiors under raked and vaulted wood and beam ceilings creates a riveting ambience of snug comfort quirky delight. 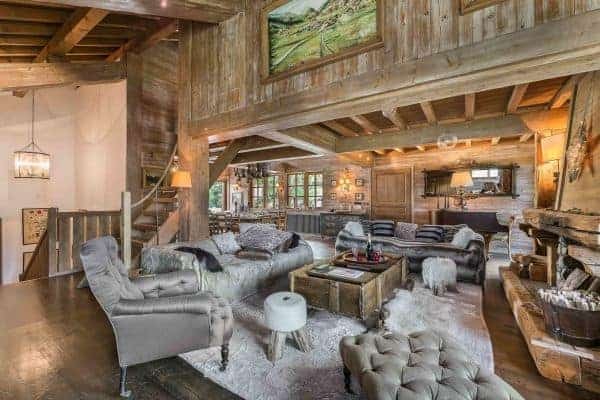 Suspended cowbells and other local embellishments hover above the open plan dining-kitchen area, while deep and generously upholstered and scattered armchairs and sofas enhance the appealing warmth in such a sprawling and open plan living area. 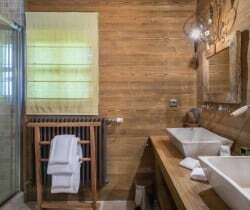 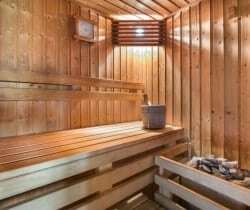 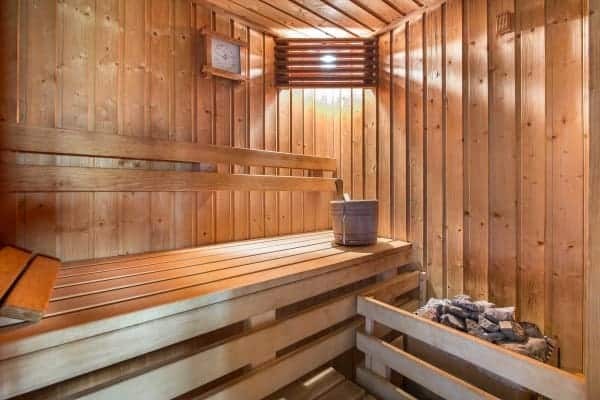 Two levels below is a spa area – all for your exclusive use and offering the welcome reward for extra pampering after a vigorous day’s activity outdoors. 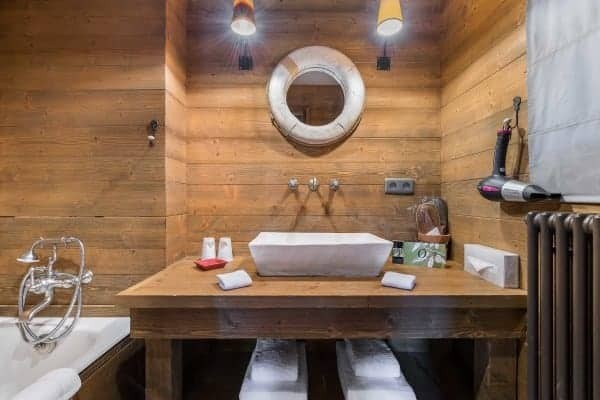 Enticing and contemporary, the spa features a sauna, hamamm and a generous swimming pool bordered one side by a viewing window to the snow-covered slopes just outside. 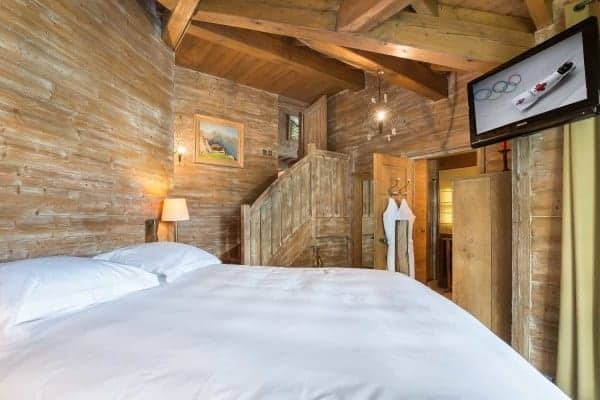 With 4 levels – the highest at the ‘ground 0’ level of the entrance hall and garage – this lovely luxury chalet sleeps up to 10 adults and 2 children in 5 enticing bedrooms with modern tile-wood combination bathrooms en suite; among these are a master suite with fireplace and a ‘family suite’ with adjoining double and twin rooms. 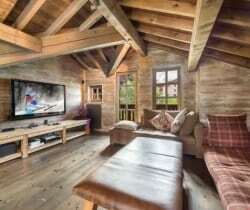 The highest quality of comfort is guaranteed wherever you will happen to find yourself: whether snuggled up in the comfort of the finest bedding or out on invitingly luxurious sofas of the main living area that allows open access to the kitchen-dining and television areas. 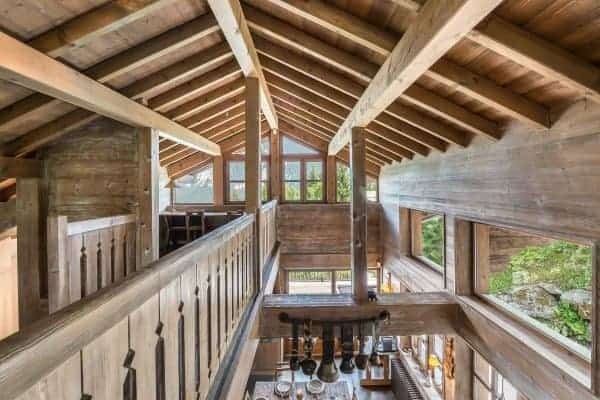 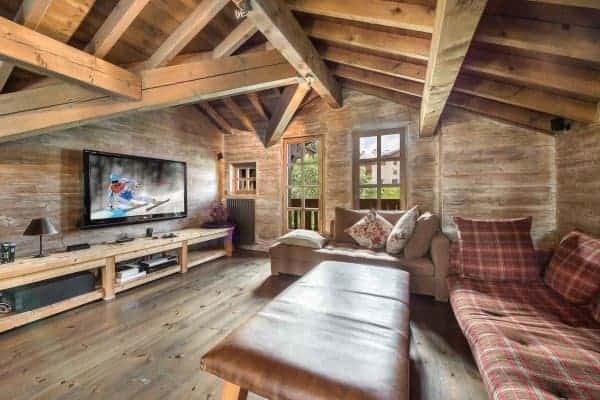 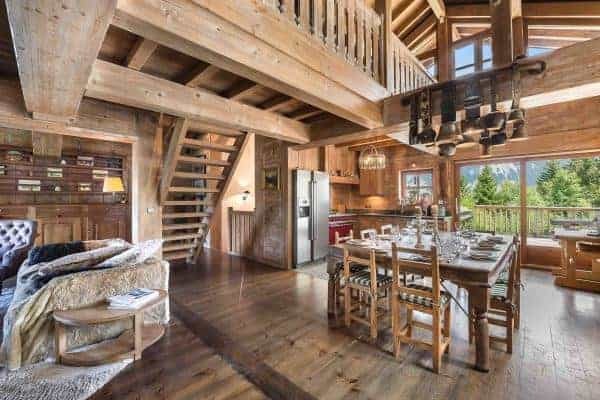 From the living area you can step up to find yet more tranquility in the vaulted church-like mezzanine under the eaves or you can step out onto the terrace, from which you can enjoy the classic alpine scenery al fresco; après-ski and ‘en famille’. 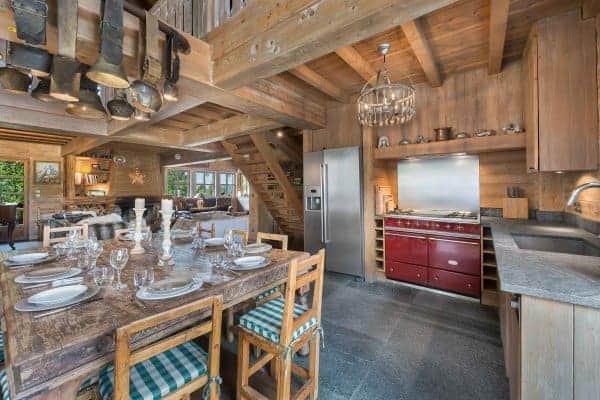 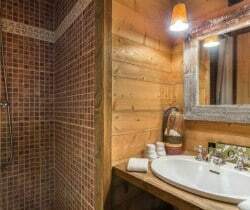 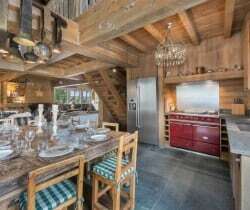 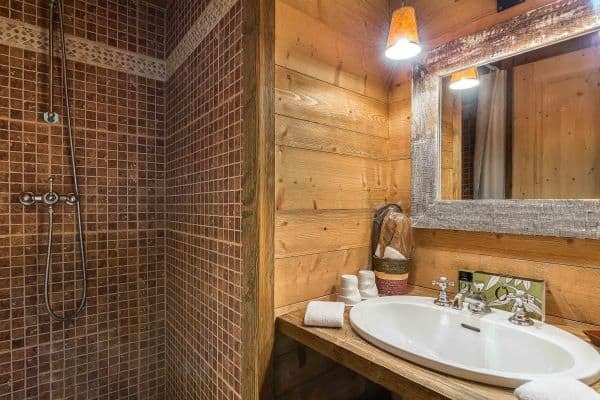 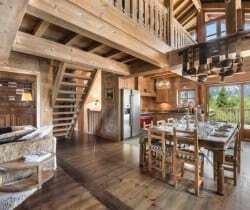 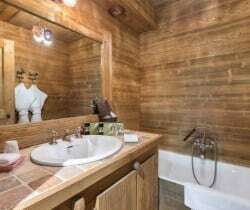 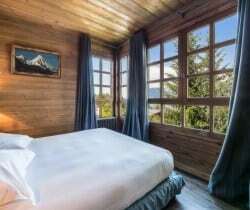 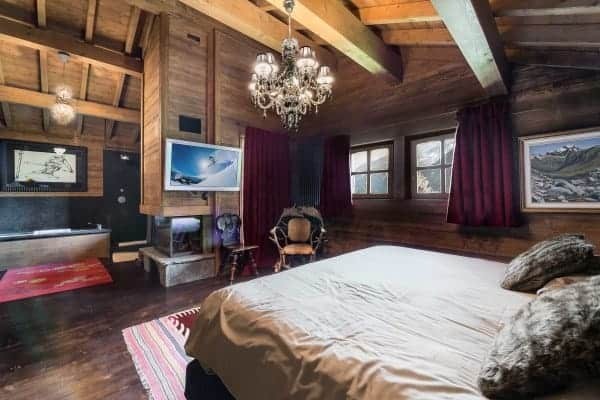 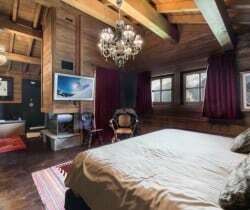 This refined and luxurious chalet incorporates the highest in quality of standard and service for a family to have and to enjoy all by themselves or to generously share, with a degree of independence, with close friends.